Summer is almost over and I have to squeeze in a sweets post. Then, we'll begin our goody-two-shoes fall schedules and steer clear of that menace called sugar. But before you go and get all healthy with your planned balanced meals for the new school schedule, ask yourself one question. 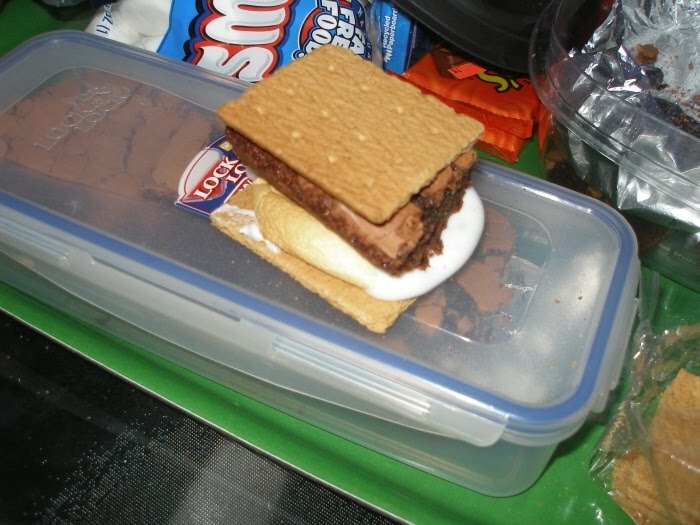 Have you had S'mores yet this summer? If not, do I have some suggestions for you. This summer we were introduced to two new variations on the whole S'more theme. Let's first review the basics. From top to bottom a S'more is: graham cracker, roasted marshmallow, squares of chocolate, graham cracker. They're delicious. You already knew that. What if I told you that you could substitute a large Reese's Peanut Butter cup for the squares of chocolate? What if I told you that you can also substitute a (whole) brownie for the squares of chocolate? Sorry. It's hard to take good pictures in the dark. Am I your new hero? 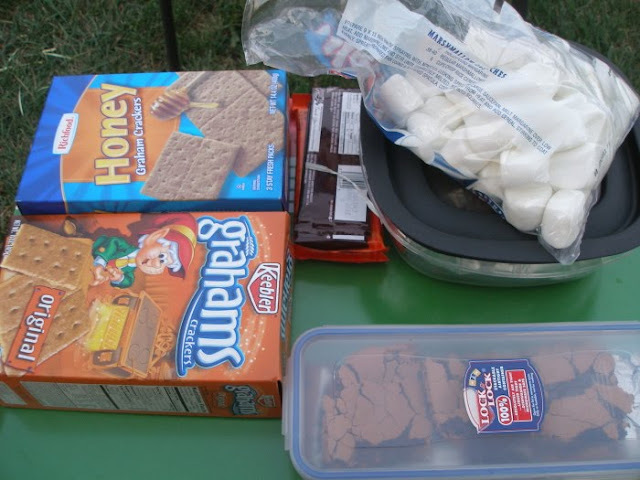 Well, wipe up that slobber and plan a back to school hurrah complete with S'mores made three ways. Ours is set. Wish I could see you there! Ah, s'mores. 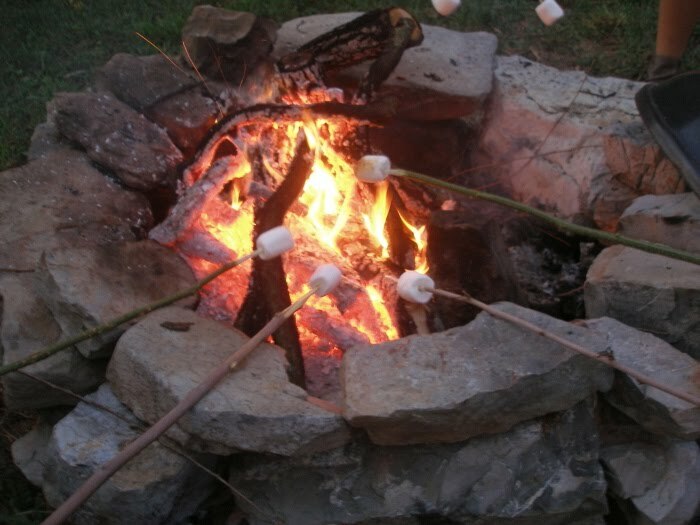 We always have a harvest bonfire in October, and s'mores are always on the menu. This year I"m providing peanut butter cups and brownies too...thanks for the suggestions! :-) Enjoy your sugar high! I have been hearing people talk about Reece's S'mores, but I've never heard of the whole brownie! Too good. Thanks for answering my meat bird question... sorry I didn't see the answer the first time:) I will check out the link you gave. Enjoy your last hurrah! It certainly looks yummy! I'm such a peanut butter junky, so I' love the idea of this variation! Thanks for sharing. You can also make a delicious treat with flour tortillas, marshmallows and chocolate chips. Take a plate and put one tortilla on it. Add 3-4 large marshmallows or a handful of miniature ones. Throw on some chocolate chips and top with another tortilla. Put in the microwave for about 1 minute and enjoy! You can also put a pat of butter in an iron skillet and cook the entire treat on the stovetop. Do one tortilla folded over to make turning easier. Sprinkle with powdered sugar for a fancier treat! Ooh! Thanks for the great recipe. 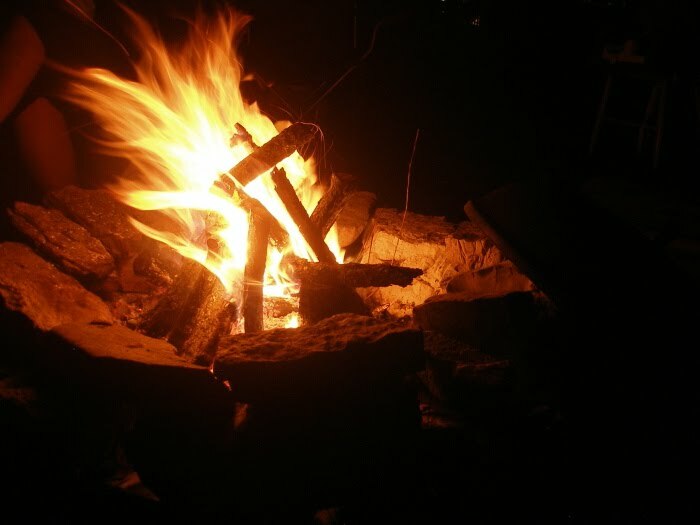 We are having our 'last hurrah' tomorrow evening with another family- a campfire and s'mores were already on the agenda, but I'll be baking some brownies and buying peanut butter cups before company arrives thanks to your suggestion! Not just MY hero...but also my family's hero!! That peanut butter cup s'more would be a big hit at my house!! I think the Reese's Peanut Butter cup inside would be super nummy! Great idea! ooh... my dad and I have been doing the killer Reeses s'mores for years! *love*!!! But the brownie?! Think I need to find me a camp fire stat! So funny. As soon as I read, "What if I told you that you can also substitute a (whole) brownie for the squares of chocolate?" my next thought was literally, "You are my new hero." We have a Christmas tradition of making them on Christmas Eve in the fireplace by the tree.